When i was in high school i was taking some visual art classes. I was hoping i would learn to draw and paint well. Actually, i never learnt to draw or paint, but i've learnt lots of other techniques and my imagination improved a lot after those classes. After i graduated i never went back to get my art works. Some of them were quite boring, but there were couple of special ones that took a lot of my time and passion. Unfortunately, i didn't even save any photographs of those works. So from time to time i remember how i made them and i regret that i didn't get them back from school. Today i accidentally found a photograph of one of my works on my computer. It is one of the works i was really happy with, so it was a nice surprise to find it. I have no idea how i still have this picture, but this is the only proof of me taking those art classes (well apart from a grade in my high school certificate). This was really conceptual for me at that time. I've been thinking of signs, and how people recognize certain objects even though they look different from what they resemble. For example, toy bunnies don't look at all like real bunnies, but somehow we recognize them as bunnies. Those ideas led me to making this road sign. 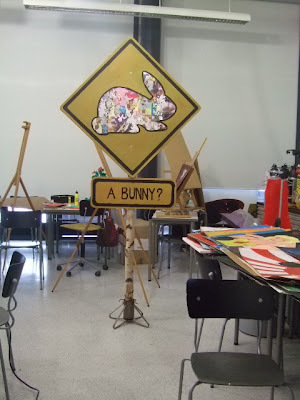 Big bunny on the sign is a collage of all kinds of bunny images, that come from comics, cartoons, photographs of toys as well as real bunnies. It looks a bit silly now, but it's a very nice memory for me. I wasn't interested in visual things much before high school, so those classes helped me a lot in doing what i do nowadays.